For aromatics, we started with the classic flavors of the region: onion, garlic, oregano, and red pepper flakes. We also added fennel, which grows wild throughout Sicily; its mild anise bite complemented the nutty chickpeas. 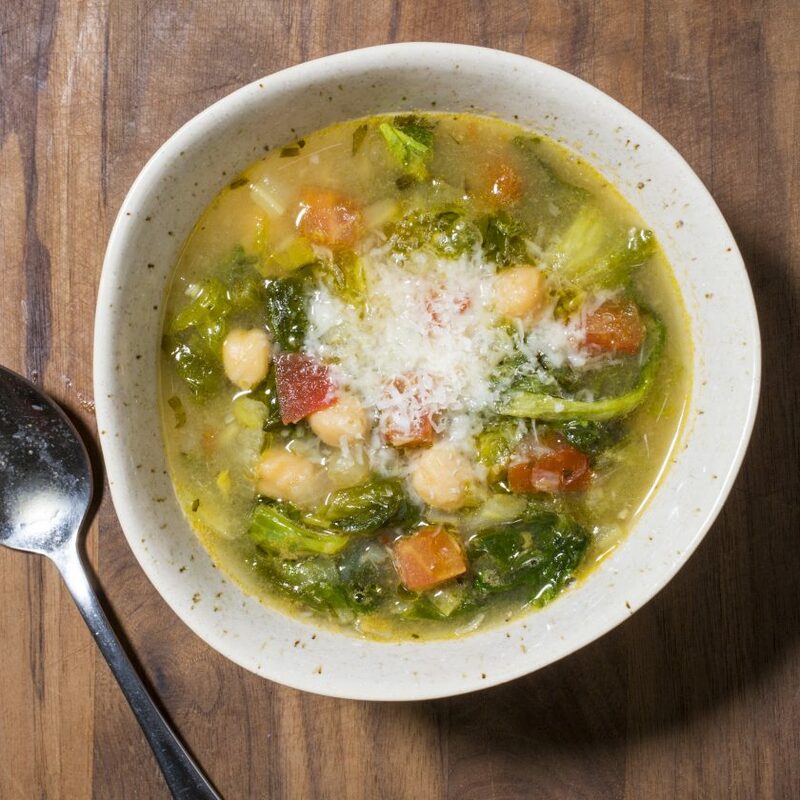 A strip of orange zest added a subtle citrus note, while a Parmesan rind bolstered the chickpeas’ flavor with a nutty richness and complexity. When stirred in for the last 5 minutes of cooking, the escarole leaves wilted until velvety and the stems retained a slight crunch. To speed up the process if you’re tight on time, you can use our quick-salt-soak method for the beans: Combine the salt, water and chickpeas in a Dutch oven and bring them to a boil over high heat. Remove the pot from the heat, cover, and let stand for 1 hour. Drain and rinse the beans and proceed with the recipe. The Parmesan rind can be replaced with a 2-inch chunk of the cheese. Stir in 7 cups water, broth, drained chickpeas, Parmesan rind, bay leaves, and orange zest and bring to boil. Reduce to gentle simmer and cook until chickpeas are tender, 1 1/4 to 1 3/4 hours. Nutrition information per serving: 455 calories; 120 calories from fat; 13 g fat (3 g saturated; 0 g trans fats); 11 mg cholesterol; 435 mg sodium; 65 g carbohydrate; 16 g fiber; 15 g sugar; 23 g protein.